Plumb Fu is an ancient form of karate, and is said to be the most dangerous style ever invented. Plumb Fu is used primarily by plumbers, who in turn go on to pass it down to their children, should they also grow up to become plumbers themselves. While not a plumber himself, Misaki is somewhat skilled in the art of Plumb Fu, but prefers to fight with traditional karate moves. Instead, he taught Plumb Fu to Mario and Luigi so that they could stand up to Karate Koopa. What makes Plumb Fu different from other forms of martial arts is that it relies on weapons constructed from plumbing tools. Additionally, while plumbers may have trouble performing standard karate moves, they will presumably have better co-ordination using Plumb Fu. 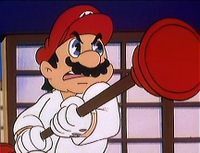 For example, Mario had trouble using a standard bo staff, but was able to use a double-sided plunger almost effortlessly. Luigi also resorted to using a nunchaku made from two small pipes that were chained together. It is unknown if there are more methods of Plumb Fu or not, as it was only ever seen in The Super Mario Bros. Super Show! episode "Karate Koopa". Additionally, Mario and Luigi never resorted to using Plumb Fu again, despite having mastered it and succeeding in defeating Karate Koopa and his Ninjis. This page was last edited on August 30, 2018, at 05:34.